Trail Condition: Trails are closed for the season. 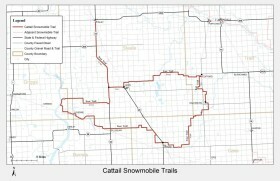 The Cattail trail offers trail traveling through field, woods, lakes, prairie trails, sloughs, and ditches. Offers fuel stops, restaurants, and bed and breakfasts.